Chamber Music at the Clark concert seating is determined via lottery. The booking-by-lottery entry form for Argus Quartet concert seats posts here on Thursday, December 13, 2018. Lottery registration closes Thursday, January 3, 2019. Argus is dedicated to reinvigorating the audience-performer relationship through innovative concerts and diverse repertoire—connecting with and building a community of engaged listeners is at the core of the quartet’s mission. The quartet believes that contemporary ensembles can honor the storied chamber music traditions of our past while forging a new path forward. In that spirit, their repertoire includes not just staples of the chamber music canon but also a large number of pieces by living composers. First prize winners at the 2017 M-Prize Chamber Arts Competition, the Argus Quartet’s recent and upcoming performances include appearances at Carnegie Hall’s Weill and Zankel Halls, Roulette, the Albany Symphony’s American Music Festival, Bang on a Can at the Noguchi Museum, the Hear Now Music Festival, Providence College, the University of Michigan, James Madison University’s Contemporary Music Festival, Princeton University, the Shalin Liu Performance Center at Rockport Music, and the Muziekgebouw aan ‘t IJ in Amsterdam. 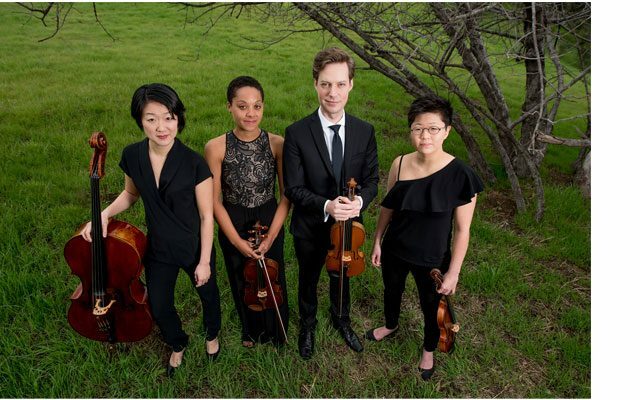 In the fall of 2017, the Argus Quartet began an appointment as the Graduate Quartet in Residence at the Juilliard School, where they worked closely with the Juilliard String Quartet. During the 2016-17 season, they served as the Ernst Stiefel Quartet in Residence at the Caramoor Center for Music and the Arts. From 2015–17 the quartet served as the Fellowship Quartet in Residence at the Yale School of Music and was the first ensemble to be mentored by the Brentano String Quartet in that capacity.